This last weekend I finally got a chance to get out and put some rounds down range with my new Mossberg 464 SPX. For those of you who are not familiar with this rifle, it is most easily described as a “tactical” lever action 30-30. Here is a picture of the rifle from the Mossberg website. When I first saw this rifle, I really wanted it only as a joke. It is ugly, feels like an over priced novelty, and really made me think that a bunch of engineers were disgruntled when they pushed this out the door. Since I really wasn’t expecting much from this rifle and my reasoning for buying it was to annoy anyone who needed to borrow a deer gun, I let it sit untested in my safe for over 5 months. Holy crap! This is one of my new favorite rifles to shoot. The angle and ATI padded, adjustable stock look hideous, but makes it where you can barely feel any recoil. After the first handful of reloaded rounds I actually began to snicker at how well it performed. Then I went back to the basement and grabbed a whole pocket full of loads. There were cartridges with 110, 150, 170 and even a couple 200 grain bullets and every one seemed to hit the snowballs I was shooting at. After this pocketful was gone, I ran back to the basement for more cartridges. After I had shot up all my father’s reloads (about 70ish) I pulled out a couple factory boxes with 150 grain round nose. This rifle is an absolute riot. By the time I froze out and needed some time snuggling with the wood burning stove (it was about 25 degrees not accounting for wind chill), I had shot over 100 rounds through this thing. When I got inside and thawed out, I realized that I had done nothing to this rifle but take it out of the box. It was taken from the store to my safe, then from my safe to my father’s (in the back of the truck with my dog) to shoot. There literally was no love given to this rifle before the initial test. Of course I used the “official” rifle testing stance: shooting it one handed, into a hillside, wearing welding gloves, from around a tree, eyes closed, and other hand covering my nether region for protection. Again, the rifle feels like a WalMart special and looks like it was the unloved child of a rocky, one night stand between an AR 15 and a Winchester 94. It is truly a terrible looking and feeling rifle, until you shoot it. All the looks, fit and finish are immediately out the window once you pull the trigger. 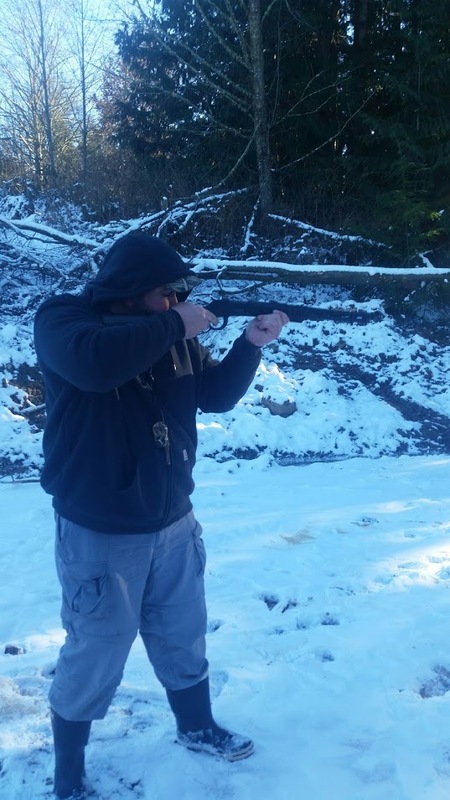 My brother, who only likes the “traditional” lever rifles like his Winchester 94 in .32 Winchester Special, was giggling like a little school girl while running around too look for more rounds. The stock geometry reduces the recoil to an almost negligible amount. Whatever recoil is left is well absorbed by the ATI stock. The sights are amazing. They are fiber optic 3 dot sights that almost glow even in really low light. Even though the lever feels flimsy and I was concerned about the action, there was never even a scuff on the brass or slightest of issue with cycling. The rounds just glided into the magazine tube, out the tube and into the chamber and then easily expended into my hand to shove back into my pocket. I never dropped a single round of loaded or expended brass in the cold, nastiness in which we shot. The angles are perfect and it is very easy to just toss this rifle up to get a good site picture. There is none of the “head migration” thing that needs to take place until you get a comfortable spot to rest your cheek. It is simply a comfortable rifle to shoot. This thing is also quite lightweight. I could see myself collapsing the stock and strapping it to a backpack. With the matte finish and plastic furniture, the weather does not have that much of an ill affect on this rifle. My brother had to Barrocade the crap out of his .32 before and after shooting to keep rust off of it. I just tossed mine into the back of my truck and dusted it off when I got home. It annoys the hell out of anyone that doesn’t shoot it. This is a huge plus when you shoot around the “Name Brand Elitists” that hate anything that didn’t get all 5 star reviews from AR15.com. Just so everyone knows, I am going to clean it up and give it a spa treatment tonight. It deserves it. This entry was posted in Firearms and tagged 30-30, deer rifle, lever action, Mossberg 464 SPX, rifle on January 3, 2017 by Woodsbum.